This Wednesday 27 July, a host of New York artists including serpentwithfeet, Sadaf, and LSDXOXO will play a benefit at Trans Pecos to raise funds for Brooklyn Movement Center, an organization that campaigns for police accountability, as well as a number of other crucial community issues. 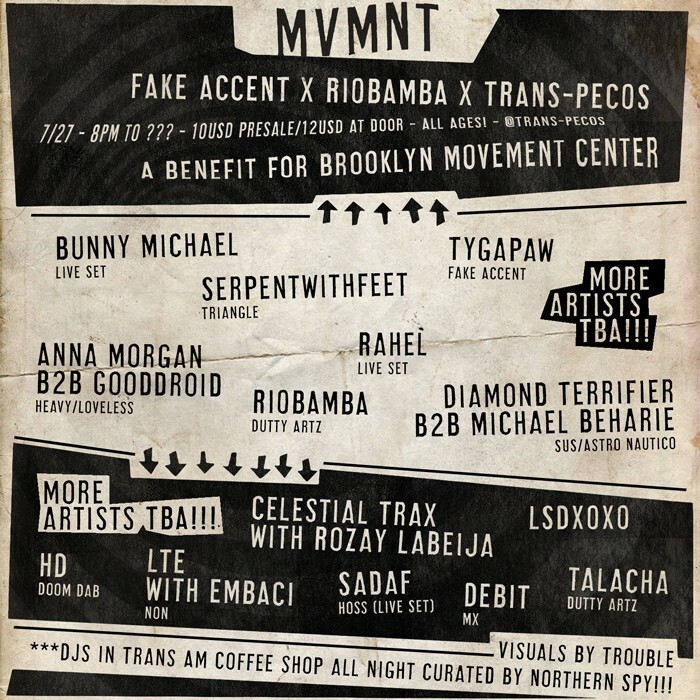 Titled MVMNT, the night has been organized by Fake Accent promoter and producer Tygapaw and Ecuadorian-Lithuanian DJ RIOBAMBA, alongside the team at Trans Pecos. A statement on the event's Facebook page calls for an "end to gun violence, institutionalized racism, and state sanctioned violence that continues to disproportionately impact people of color." Also on the lineup will be Bunny Michael, Anna Morgan B2B Gooddroid, Diamond Terrifier B2B Michael Beharie, Celestial Trax with Rozay Labeija, Rahel, HD, DEBIT, LTE with EMBACI, Talachan, and more to be announced. The show is open to all ages and will start at 8 p.m.